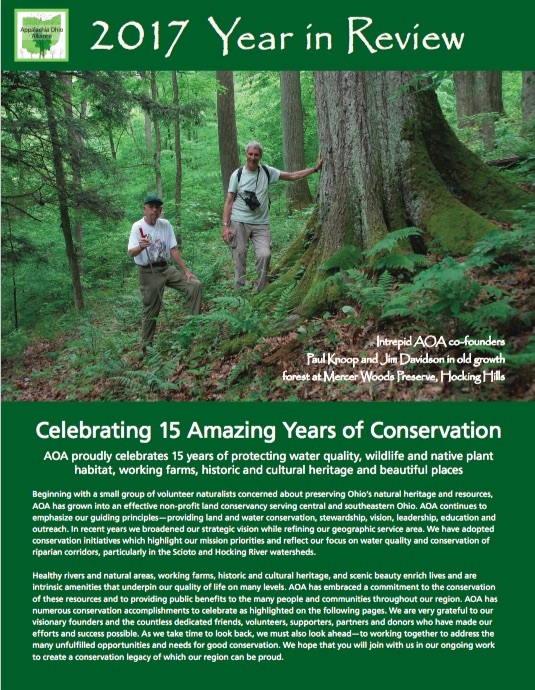 The Appalachia Ohio Alliance (AOA) is developing a demonstration site and preserve in the Hocking Hills to highlight our land and water conservation and stewardship mission. Designated by AOA as the Gosnell Preserve the proposed property is favorably located and well suited to serve as a demonstration site and to provide demonstration, outreach and educational opportunities to the local community, land owners and visitors to the area. The demonstration site incorporates and builds upon the conservation vision and leadership of Clyde Gosnell whose land and water stewardship and habitat restoration practices are existing features of the property. Located just north of Rockbridge the demonstration project area is bisected by US Highway 33 and provides excellent visibility and accessibility to visitors. 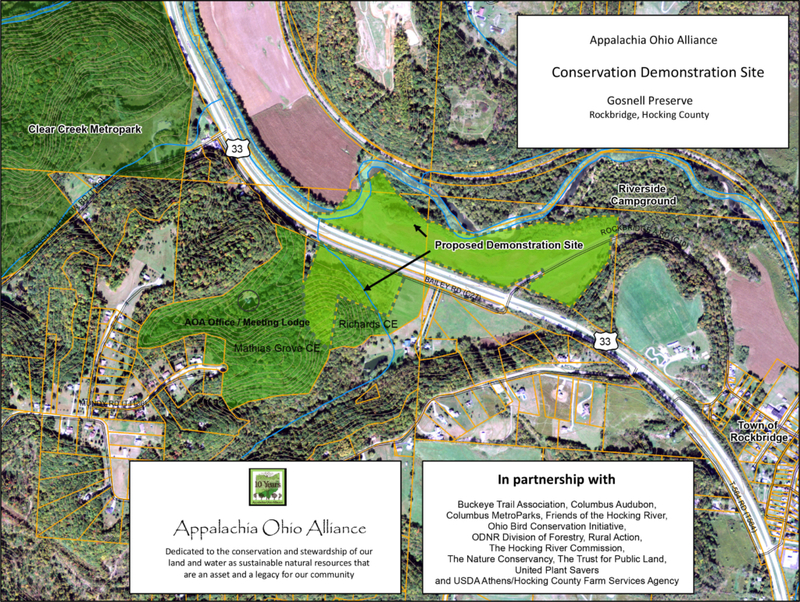 The nucleus of the demonstration area consists of a 42-acre parcel recently donated to AOA by the Gosnell family. AOA is supplementing the core site with adjacent properties protected by AOA conservation agreements as well as additional properties that may be purchased to enlarge the preserve. The demonstration site is intended to serve as a “one-stop shop” where visitors can experience a variety of natural habitats typical of the greater Hocking Hills region including bottomland forest, upland forest, prairie, vernal pool, pond, wetland and river and steam riparian habitats. The site will be designed to allow visitors to observe and learn firsthand from interpretive signage and materials as well as from a range of conservation, stewardship and management activities and demonstrations carried out and promoted by AOA and our partners. In addition, the site will also provide opportunities to promote the compatible work of our comparable and collaborative partners. Outreach messaging will include the larger concept of a regional approach to conservation and the importance of connectivity of conservation lands and habitats in the greater Hocking Hills region. To help kick start this project AOA is applying for appropriate grant funding to complement partner commitments. AOA has solicited support and engagement from many of our compatible partners as part of this endeavor. The demonstration site project will feature inputs and assistance from a consortium of respected conservation, stewardship and nature-based education and recreation organizations that are active in the Hocking Hills region and that are partners in our efforts. Participating partners include but are not limited to: Buckeye Trail Association, Columbus Audubon, Columbus MetroParks, Friends of the Hocking River, Ohio Bird Conservation Initiative, ODNR Division of Forestry, Rural Action, The Hocking River Commission, The Nature Conservancy, The Trust for Public Land, United Plant Savers and USDA Athens/Hocking County Farm Services Agency. The inclusion of compatible and complementary groups reinforces the message of a regional and collaborative approach to land and water conservation and stewardship as well as the connectivity needed for healthy habitats in the greater Hocking Hills region. Our collective efforts are helping to identify and address a range of related issues. Combined inputs for this project will be coordinated and managed by the Appalachia Ohio Alliance.